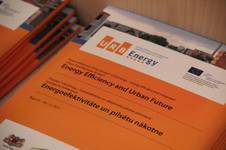 The project URB.Energy has been successfully finalised with a two-day event on 1 and 2 December 2011 in Riga. On the first day, a partner workshop was held which served to get to know the content and results of the integrated urban development concept (IUDC) for the target area Riga-Jugla and to discuss possible way to finance integrated urban development measures. On the second day, the international conference “Energy Efficiency and Urban Future” was held and received remarkable press coverage by the Latvian media. Around 100 participants took part in the event which was opened by the Vice Mayor of Riga, Andris Ameriks. In the first part of the conference the focus of presentations and discussions were on EU energy efficiency policies and funding instruments for energy efficiency. In the second part, approaches of energy efficient urban planning in Latvian cities were presented. The comprehensive results of the Urb.Energy project were presented by the project partners in the final part of the conference. To get to the documentation of both days please, follows the links below.